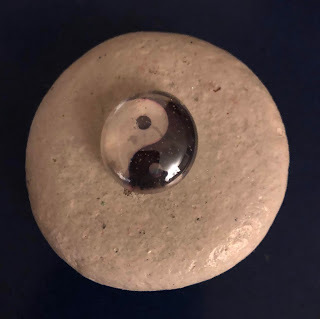 This rock is another "Spinner" Rock which is a combination of a few concepts that have come together to make a rather unique item. a spinning top using a round, flat, smooth, perfectly circular, glow in the dark painted rock. Along with this, you will need a strobe black light. A large plate with curved edges so the rock won't fall off and a pair of 3D glasses to get the full psychedelic effect. These items can be purchased online (i.e. an Amazon "Letmy™" UV flashlight and a pair of Chromadepth™ 3D glasses) both accessible and are reasonably priced. 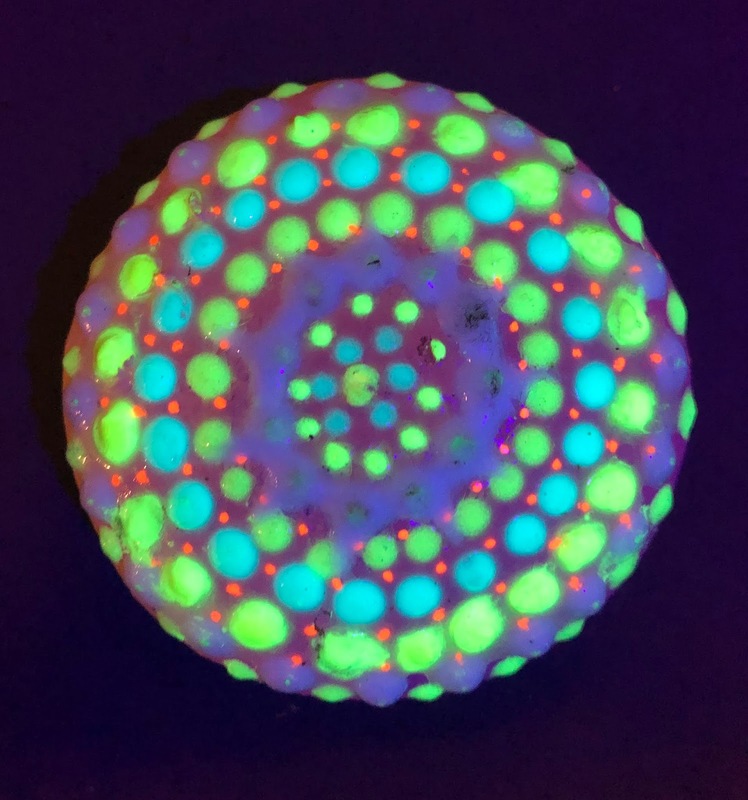 First, you paint your rock like a pin-wheel with fluorescent as well as phosphorescent paint. Create your own kind of hypnotic pattern or draw a template on the rock before painting it. Dot the top of the rock with Tulip™ Glow. You can use whatever UV reactive paint for the rest of the rock, but to get the continual glow with the lights off, you will need Tulip™ Glow. Now place a small glass bobble like the ones you find in webbed bags in the garden supply aisle of most craft stores. Use an industrial strength glue so the centered glass bead won't come off when it is dry. Let it sit overnight to harden. Lastly, give it a clear coat of Krylon™ to protect your finished product. Now you are set. Take your Spinner and give it a quick turning motion using your thumb and middle finger until you become proficient at making it spin faster and longer than five seconds. As it moves freely around the plate you can put on your 3D glasses and point your UV flashlight on the spinning rock. All I can say then is... WOW !